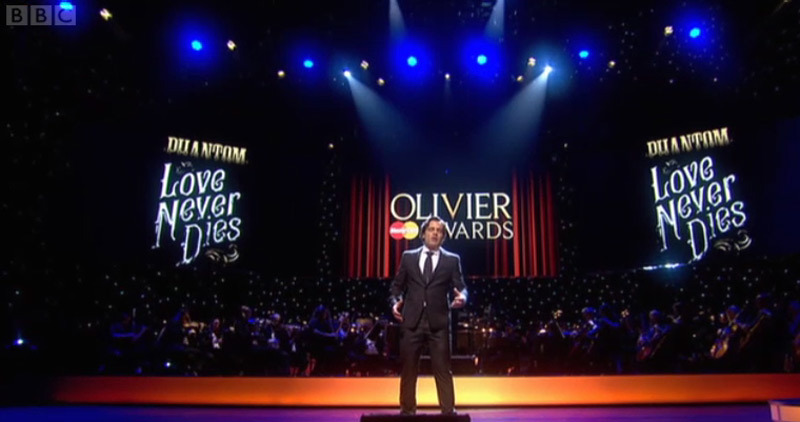 Lighting Designer and TV Lighting Director for the 2011 Olivier Awards, Ben Cracknell, needed a large profile fixture that could deliver a strong beam to wash the 80 strong BBC Concert Orchestra in shades of colored light. He found it in the Martin MAC III Profile. This year’s Olivier Awards, which are recognized as the highest honor in British theatre, featured a star-studded ceremony at Theatre Royal Drury Lane. Eighteen of the 1500 watt MAC III luminaires were configured on overhead trusses. Twelve units were grouped in four’s on three separate trusses above the orchestra to provide color wash and texture with a further six units used on a downstage truss to provide dapple and wash onto the forestage where musical companies performed. The MAC III Profiles were also used to provide sparkle into the camera for winner walk up sequences within the awards show. Other Martin gear used on the show included Martin MAC 700 Profiles™ for beam looks and MAC TW1s™ for tungsten audience backlight and architectural uplighting of the backstage.